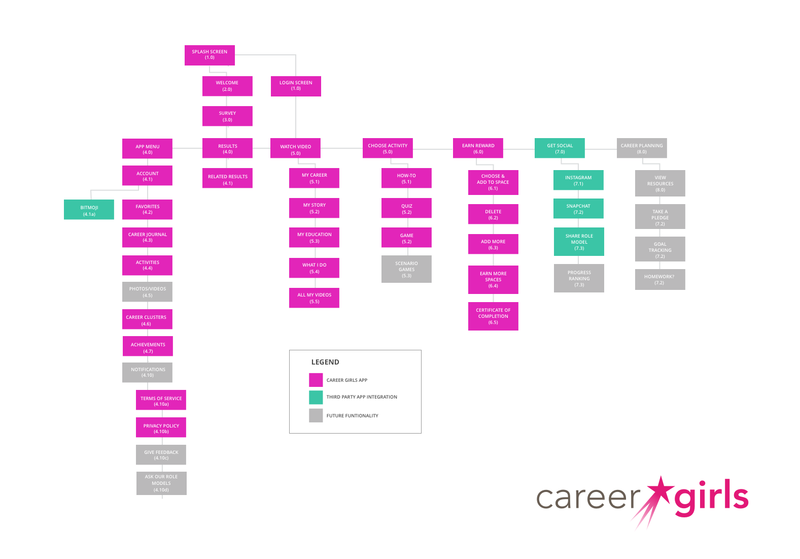 Career Girls provides career information and inspiration to girls and mentors (teachers and parents) through role models and curriculum materials. 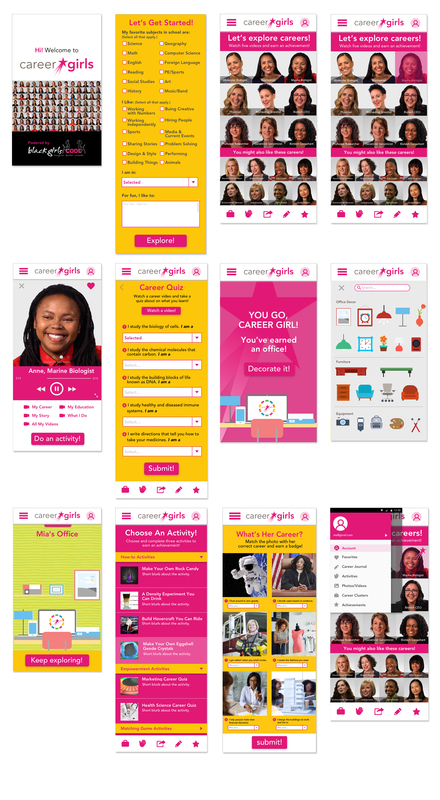 While the Career Girls website is a great resource for girls, teachers, and parents, the team felt it was time to inspire girls where they are—on their phones. This mobile app provides girls with access to STEAM career inspiration and resources—right at their fingertips. This mobile app is specifically geared to girls. Inside the app, girls can explore careers, create avatars, earn achievements, and journal about their career exploration while closing the imagination gap for girls everywhere. To fund the coding of the app, ’Berta and the Career Girls team applied for an Aquent Design for Good grant. ’Berta starred in the video and pitched the app project. The result? Career Girls was awarded the grant! Apparently, when the President of Aquent saw the clip, she actually got emotional. She really resonated with proposal since her own daughter is the target age of girls who will use the app. ’Berta’s sparkling personality—and little jig— probably didn’t hurt! Watch the grant submission video here. focus on girls aged 8–12, especially 4th grade girls, as their interest in math and science starts to drop off compared to boys the same age. provide “instant inspiration” with short video clips. help girls explore the skills they need to develop their career choices—serve as a “Careers 101” guide. give girls the ability to browse role model videos based on an their onboarding survey. filter careers to explore further for manageability, use ranking to narrow choices. track progress through video views, activities completed, and journaling. give girls the ability to earn achievements (work spaces, tools/equipment, etc. ), maybe certificates—Career Girls Grad? met with the team to brainstorm their needs, channel their experiences with users, and get a better sense of the content to be delivered. submitted a grant proposal for the Aquent Designing for Good awards, which provides funding to deserving nonprofits to move projects forward. Career Girls as one of five 2018 grant recipients. worked with the teams to conduct and analyze research, concluding that there aren’t really any similar apps available for girls. 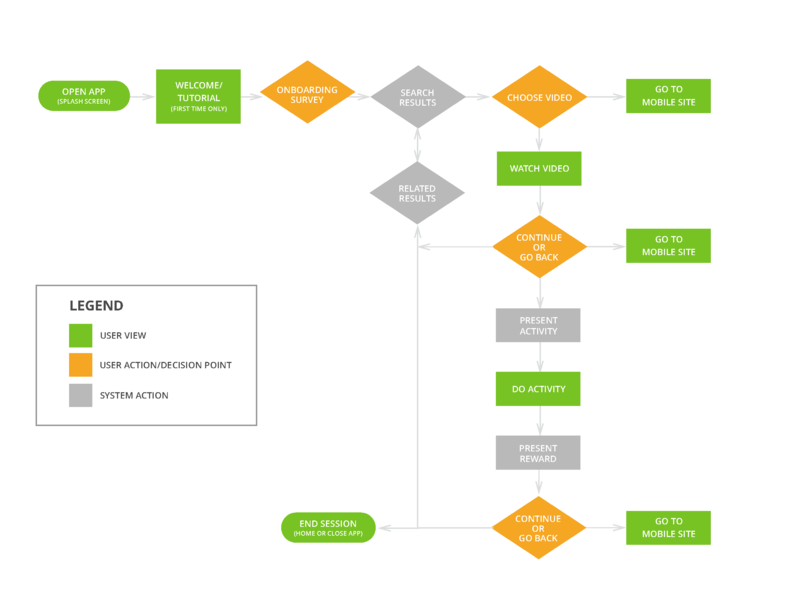 created sketches, wireframes, and prototypes, iterating through the process to solidify the hero flow and deliverables. as the Project Manager, provided strategy, process guidance, and set and coordinated checkins and schedules. provided final assets and style definitions to the coding team. Problem: Girls’ interest in STEM often drops off around grade 4. Goal: To give girls a portal to explore that’s uniquely geared to them, while increasing their accessibility to role models and empowering them to dream BIG! Solution: Create a mobile app that allows girls greater/faster access to role models and reinforcement in a way that allows girls to save and track their progress through a login model. 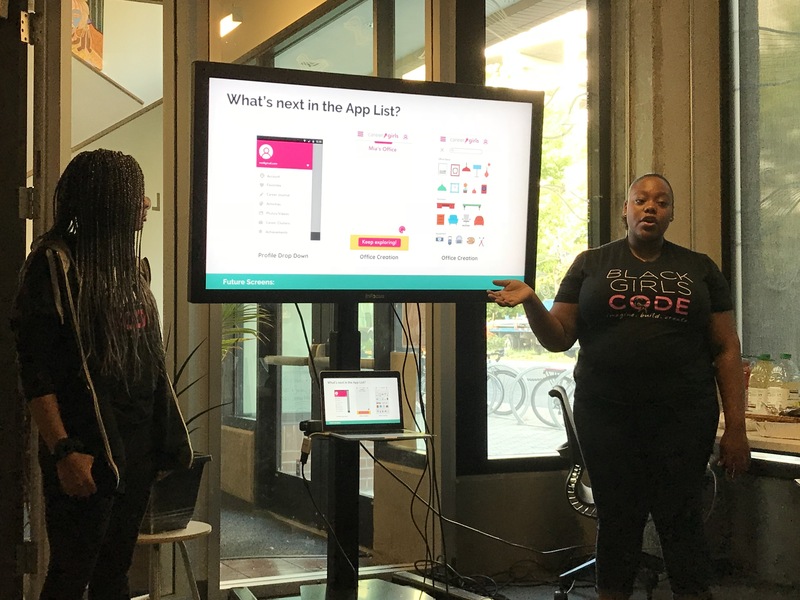 Priorities/Pain Points: Creating an easy-to-use app to make career exploration FUN without being overwhelming, so girls can gain more access to career inspiration and exploration (stem the drop off of girls in STEM). Whole researching existing apps in the space, ’Berta discovered that there really aren’t many “like” apps geared to girls of this demographic. Most apps are geared to college-age students or professionals looking for jobs. Also, the existing apps that are for girls tend to be beauty or fashion focused. How Is Career Girls Different? is specifically geared to girls aged 8–12 with career exploration and objectives NOT pigeon-holed into beauty or fashion. focuses on stemming the flow of girls dropping out of STEM studies. is not specifically focused on college readiness or planning, but more on inspiration. is geared towards STEM, but also includes other career fields such as the arts (STEAM). 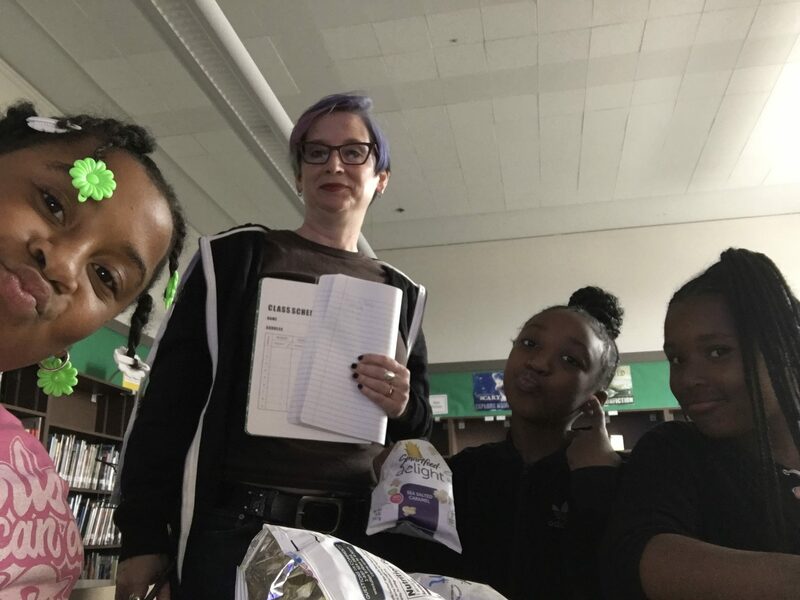 Working with a local San Francisco elementary school, Career Girls created a Girls Club that meets every week to do activities and talk about careers. 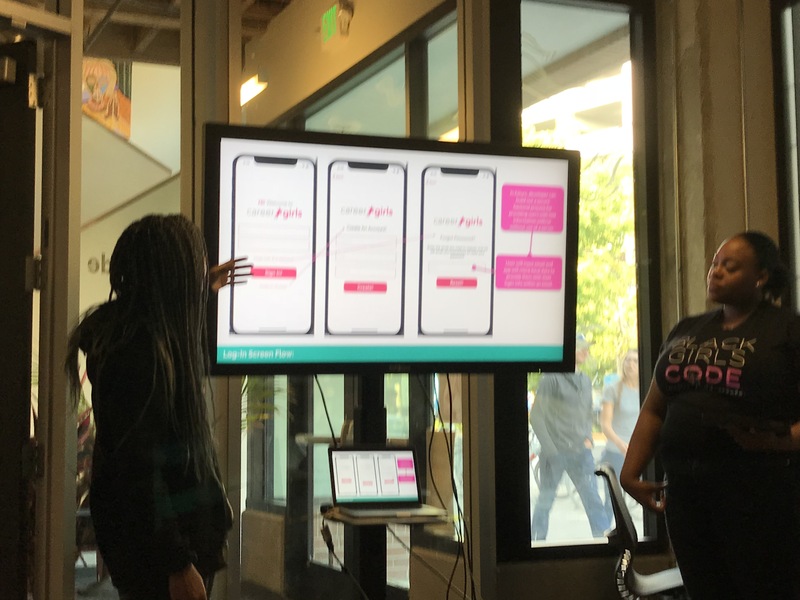 ’Berta and the team leveraged access to the Girls Club to talk to the girls about the app, and to get their feedback on wireframes. 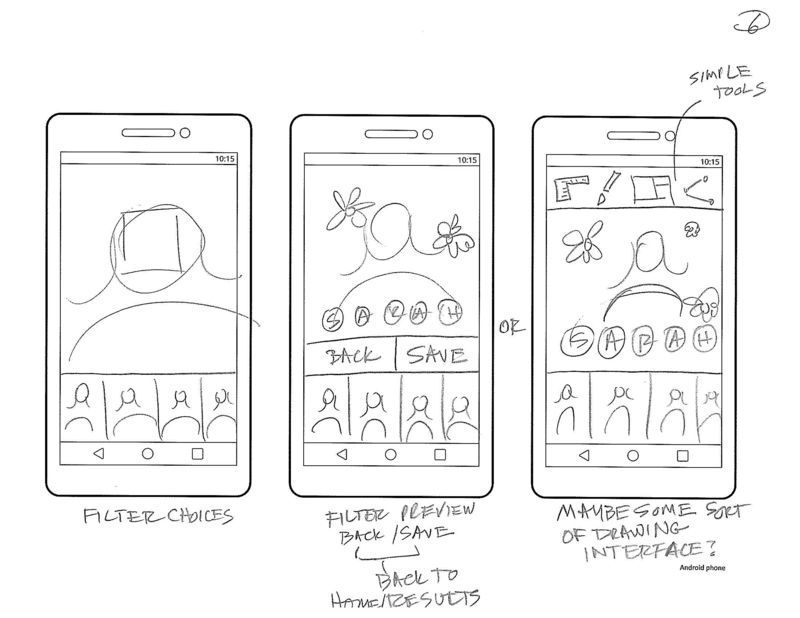 Through this, the team gained valuable insight about what girls wanted to see in an app. ’Berta and the team also tested with other girls, conducted a survey, and met with female curriculum developers to get their insights into what works and doesn’t work to inspire young girls to do activities. Having daughters themselves, these developers had had invaluable insight into what motivates girls to become engaged and to learn. See an interactive prototype here. created the dashboard (i.e. video filter page), which is currently populated through YouTube links. The app opens YouTube and then the user closes the window after watching the video. 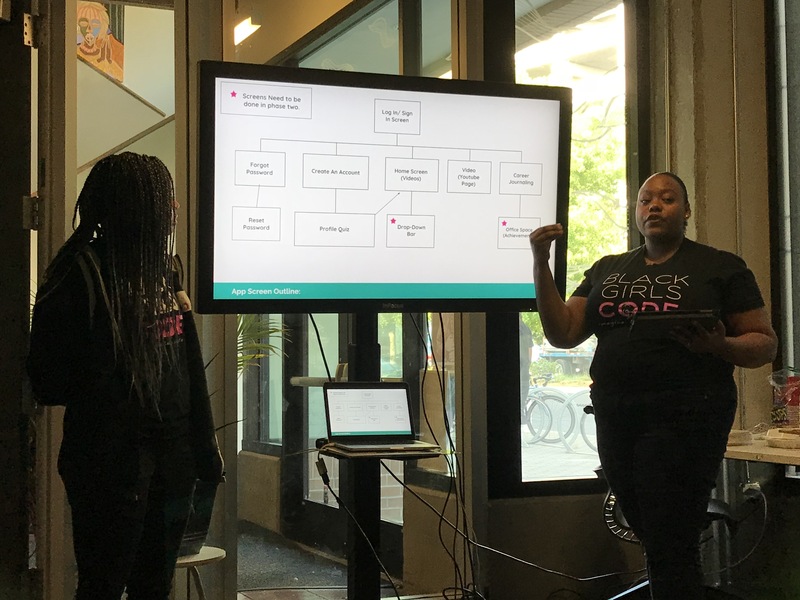 A great learning experience, the Black Girls Code team learned valuable, real life coding skills they can use in their careers moving forward. 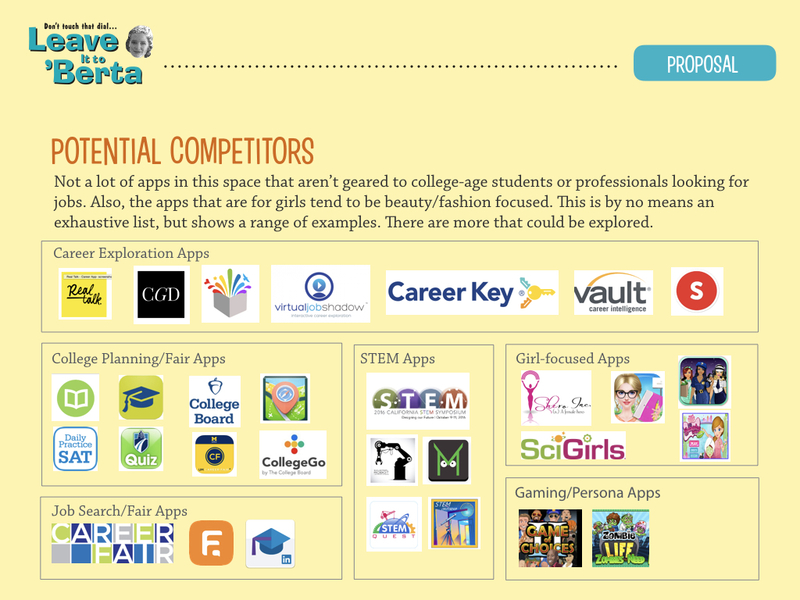 The app is being coded by girls for girls—squarely in keeping with Career Girls’ mission. Phase 2 is already underway with the identification of two new girls, and two mentors (iOS and Android). 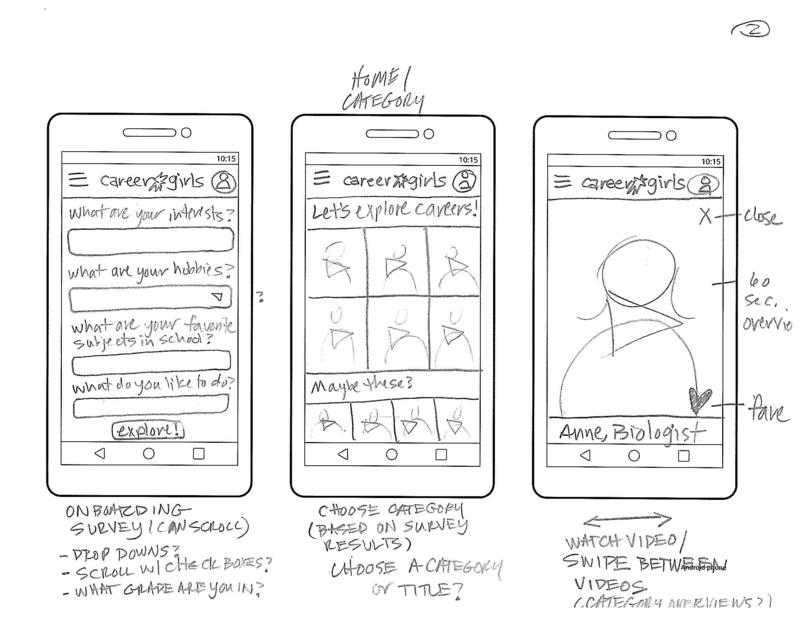 Work will begin in the next few weeks to review the progress that’s been made (in conversation with the previous team), and will involve fleshing out the remaining functionality, and posting a beta release for girls to test out by late spring of 2019. Shortly thereafter Phase 3 refinements and bug fixes will begin. Stay tuned for updates!